Burnt dirt. Sourness and fermentation. An intoxicating rot from something that was new not so long ago. From the hilltop, the rattles and cries had cascaded down in search of the riverbank, bouncing off trees and sifting through smoke and brush. Earlier, goats and cattle, their adorned shepherds, and women peering under darkened, ochre brows crisscrossed roads only occasionally disturbed by vehicles. The route had turned from chopped up rocky trails to a dry riverbed prone to flash floods during the rainy season. Empty, it was like traveling across a landlocked beach, tires sinking and spinning, struggling for traction and momentum. 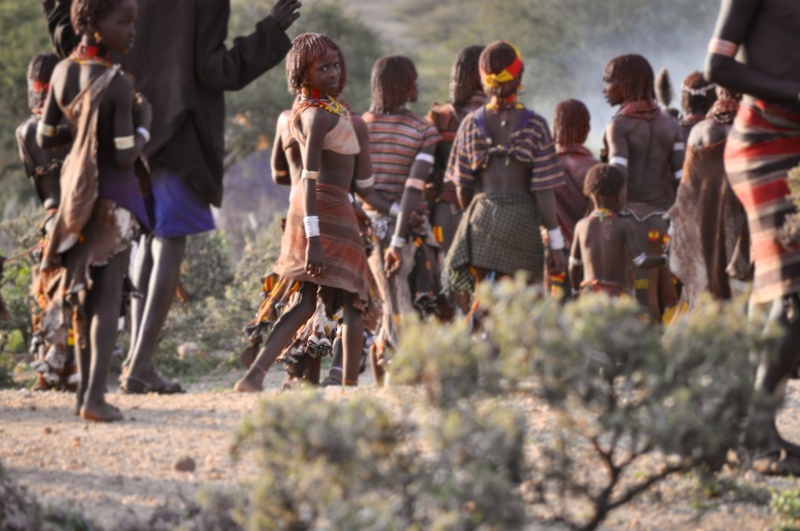 There are fifteen ancient, remote tribes in southern Ethiopia’s Omo Valley. We had visited three before setting out toward Asli, a village of the Hamar Tribe situated along a riverbed less than 50 miles from the border with South Sudan. With the other tribes, we had simply meandered through villages, heard about their traditions, and interacted with tribal members. Asli, however, was to be something altogether different and profound. By the time we reached the top of the hill, the distant hum of the experience that had been dripping on us with each step suddenly swelled and doused us in a powerful musk. As my feet finally planted and I gazed over the scene – women raising a cloud of dust with their primordial cadence, smoke rising from modest open fires, men huddled in unbroken clusters, blood-torn flesh glazed in perspiration on bare backs – I began to lose my balance, and any sense of centeredness. The anxiety rose and I felt faint. I was slightly nauseated and sweating, and I felt like I was standing drugged on a crumbling ledge. The Hamar people – once hunter-gatherers – are now cattle herders and prolific farmers. Their villages dot the hills and valleys, and they are among the more visible tribes of southern Ethiopia – frequenting the roadsides, making their way from village to village, between village and market, or moving their herds from one pasture to another. They are especially striking people – especially the women. 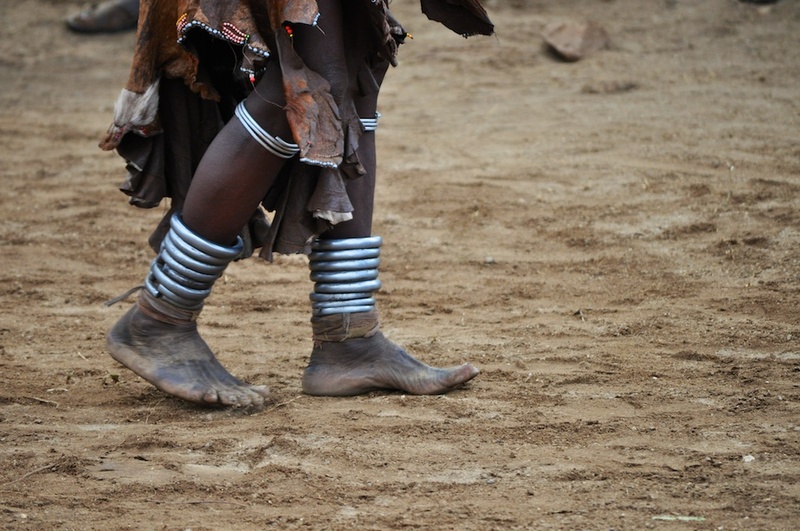 They are modestly covered with simple clothing made of cow and goat hide. Sometimes you’ll see someone with a cotton t-shirt, no doubt procured from the flood of used clothing that makes its way to Africa off cargo ships, bundled in car-sized bales. Both men and women are adorned with vibrant jewelry: bracelets, beadwork, necklaces, hair clips – some with significance (such as whether a woman is a first or second wife), and some merely for decoration. The women’s hair is covered in clay, which oftentimes covers their ears, neck and brow. The men wear their hair in all variety of designs based on personal tastes. Patterns and designs are etched on bodies, created by cuts that are then packed with ash and charcoal, leaving raised and bubbled scars. Through the valley, what were no doubt once narrow, storied footpaths, have evolved into roads for the intermittent passing of Land Cruisers. Though the Hamar and other tribes have had to make room for modern civilization in such ways, they have remained steadfast to ritual and tradition. They begrudgingly have opened up their communities to visitors in return for the small income it brings to help buy cattle, or pots, or maize. They pose for photos for a small price (usually around 25 cents). They are tough negotiators, and extremely strong-willed. They are friendly, though not often warm. More vine than branch, the whips look to be slightly more than a meter long. They are so thin at their ends, they blur against the sky and completely disappear against the darker backdrop of terraced hills. If not already carried by a man, they are imposed upon one by the woman willing to demonstrate her devotion to her brother – the one who later will jump a line of bulls for his right to marry. Only men who have already completed the bull jumping ritual – the Maza – can take part. She stands boldly just within the encircled crowd. She shouts and springs up and down on the balls of her feet. With her eyes alert and fierce and unblinking, she demands it, as though assigning proxy for what seems – at least in some part – her own self-flagellation. Demonstration of her dedication. Her commitment. Her resolve – to her brother, to her family. Her arms raise forming wings of transcendence. Gazing at her, I try to imagine what place in her dreams she might have taken herself. But it’s clear. She – like the rest of us – is right here. Face to face, the man brings the whip back along a sideways shallow arch and in one spontaneous yet choreographed motion, three-parts brutality one-part finesse, casts the whip toward her side and then jolts it quickly backwards, interrupting its momentum abruptly so as to force the tip to whiplash against her back. Thrashing her skin and opening it up, the blow cuts a new wound atop old ones. Her back now torn, she finally settles. She does not wince. Nor cry. Somehow emboldened by her growing collection of scars. Deeply proud of each one. Dignified, satisfied, she takes her place back in the march. Within the eerie cadence. Back into the clamor. My friend, Shikha, would tell me later that as she stood watching this ritual, a Hamar woman quietly came to her side and took hold of her hand, comfortingly offering assurance that, though so clearly very foreign – still – here, everything is all right. Later, after a short rain interrupted the ceremonies, the gathering of the bulls began atop the hill. Lined up ten deep, side-to-side, and circled by the crowd. The jumper, assuming successful, would meet his bride days later. His family in charge of her selection, he only had one thing to do. One thing to prove. Naked except only for a thin necklace. His family and male friends surrounding him. Women, embracing each other’s bloodied backs, watching. The bulls, oddly calm after their own brutal orientation. Giving himself no more than three modest strides, his small frame (no more than 5’6”) sprung atop the first bull he encountered. His arms flailing, he danced his way across their backs, landing in dust and the arms of his family on the other side. He turned and returned across the backs. Again, and yet again. Four times, he managed the energy, strength and agility to complete this task, which was central to everything that preceded it. A symbol of his worthiness. An indication of his ability to protect his bride, whom he will meet for the first time in fifteen days. His undertaking complete, he was wrapped in a hide to cover his nakedness. His male family members huddled around him, and began to chant blessings for him and his wife-to-be. The chorus was soft and solemn – touching and powerful. As the crowd retreated back down the hillside, there were more clusters of celebration, and lines of women singing. It was spectacular to look across. It was overwhelming to be nearby. This was not some spectator event choreographed for a group of tourists. No. It was a sacred, prehistoric rite of passage that has been practiced the exact same way for ages. 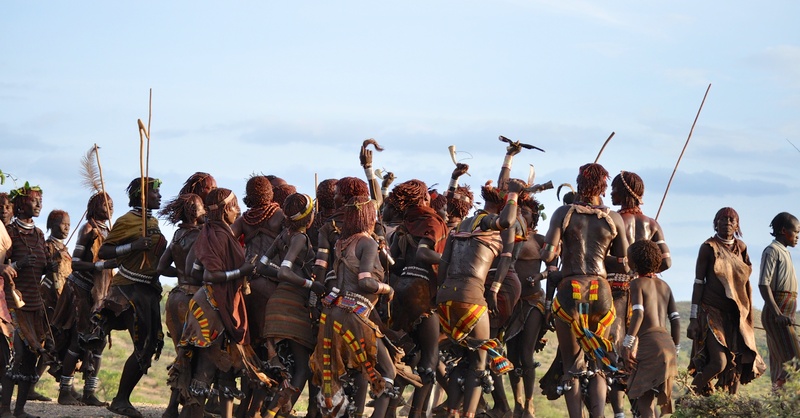 The Omo Valley is not heavily trafficked by tourists, and those who do make the challenging journey are only afforded rare chances to attend a Hamar tribe bull-jumping. My emotions struggled to catch up to the scene. I felt heavy, and awkward, yet privileged and deeply moved. It was a great deal to try to take in. I was crying, but I couldn’t produce tears. The violence made it hard to reconcile. And it took a lot to stand there without judgment of what I had witnessed. To call it “beautiful” seemed misguided. To call it “brutal” seemed naïve. There is a couple staying at our Addis Ababa hotel who are here to adopt an orphaned Ethiopian baby. Their baby had been abandoned in Harar – a town in eastern Ethiopia. It is known to be roamed by hyenas at night. Sometimes, babies are abandoned by young mothers in the nearby forests where the hyenas discover them. Every time I see a television that’s turned on, it’s invariably tuned to the news. And the news, invariably, is about Gaza. Or the Malaysian jet crash site. Or Ebola. Or Congress. I have to divert my attention, searching for a brighter, empty distance. I strain to tune it out. If I can, I walk away. But no matter. I veer back and take my place in the march. Within the eerie cadence. Back into the clamor.